Itoman Tug-of-War features plenty of characters dressed in traditional clothes for the occasion. Farmers and fishermen have always paid tribute to the Gods, seeking favor for good harvests and large catches of fish in their nets. 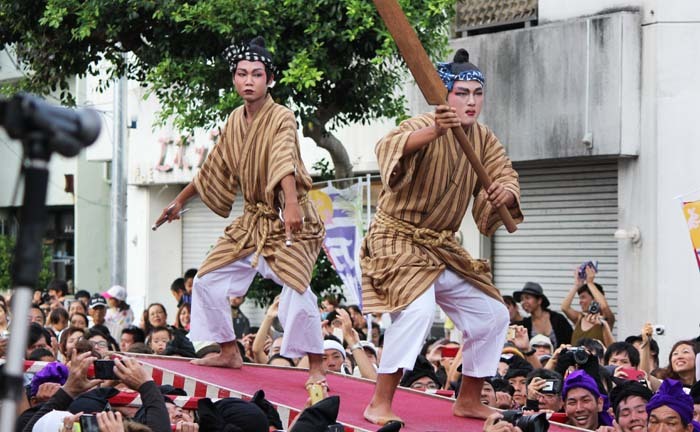 One of the traditions to gain favors with the Gods in Okinawa is a tug-of-war. In Itoman, the whole community takes part and the rope is woven together on the spot in one day. Many communities and villages throughout Okinawa organize their own tug-of-wars for more or less for their original purpose, but a few of the events have grown into showcases of local culture and attractions for tourists to the city or town, the best known of these being the Giant Naha Tug-of-War that has secured a certificate in the Guinness Book of Records of being the largest in the world. The Itoman City Tug-of-War is a community event that also marks the end of the summer. The event always takes place on Aug. 15th of the lunar calendar that falls on Thursday, Sep. 15th in the western calendar. 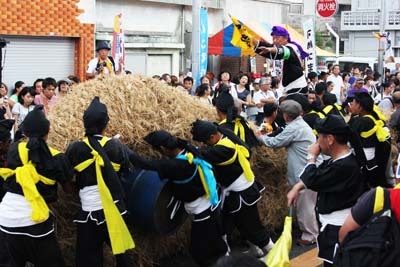 The Tug-of-War also marks the celebration of Itoman City Full Moon Festival. 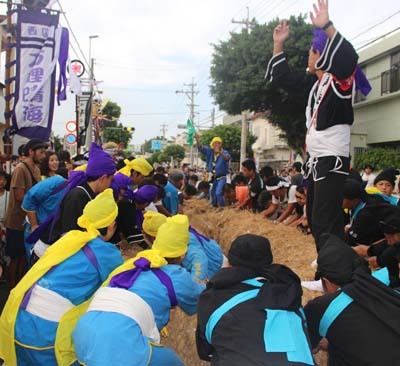 The festival starts with an opening ceremony on the Itoman Elementary School grounds at 13:30, then proceeds in a parade to Hakugindo Shrine and finally to the tug-of-war that begins about 17:15 at Itoman Rotary. The tug begins as soon as the halves of the rope are joined. Route 331 is closed all day between Hakugindo Shrine and Itoman Rotary from 8:30 to 21:00. The road between Itoman Elementay School and Itoman Rotary is closed from 14:00 to 17:00. Everyone on Okinawa is invited to participate. The tug-of-war, one of Okinawa’s largest and most spectacular, centers around a pair of 1.5 meter wide ropes which, when linked together for the event, stretches 180 meters. Townspeople and visitors join hands to move the Rope of Citizens, as it is called, a few meters during a pitched battle lasting up to half an hour, after which the winning side is announced. Usually, more than 10,000 people take part in pulling the rope. Instead of dividing the teams to East and West, in Itoman the competing teams are North and South. In modern times North has won the contest 36 times against 29 wins of South. The contest has ended in a draw four times.